Come visit our San Luis Obispo furniture store! 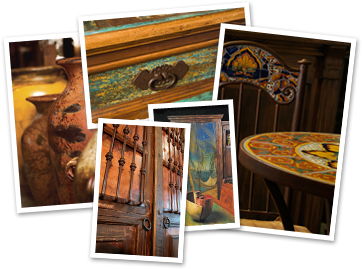 From our richly detailed furniture to our colorful decor, every Luna Rustica piece is distinctive. Our "signature style" began with our artisans in Central Mexico where we have been sourcing furniture, indigenous crafts and decor for our stores on the central coast the last 18 years. Our furniture stores showcase a spectrum of materials such as exotic woods, forged iron, hammered copper and cut stone are used to reflect the country's unique materials and craftsmanship. The integration of reclaimed materials from India and Indonesia has harmonized the global influences that make our San Luis Obispo furniture store a destination for people all over the state, as well as a SLO town favorite. Every Luna Rustica piece is aimed at defining your home and lifestyle, while focusing on sustainability through use of salvaged materials and small artisans and carpenters. Whether that lifestyle reflects spanish hacienda, coastal cottage, ranch, urban rustic or green living; Luna Rustica has the ability to source exactly what you're looking for.